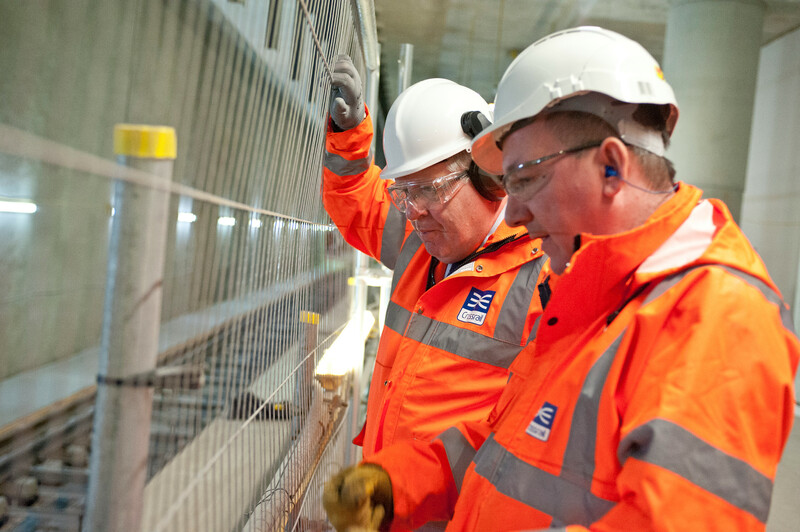 Transport Secretary sees Crossrail progress in southeast London - Crossrail . For information about the Elizabeth line please visit the Transport for London website. 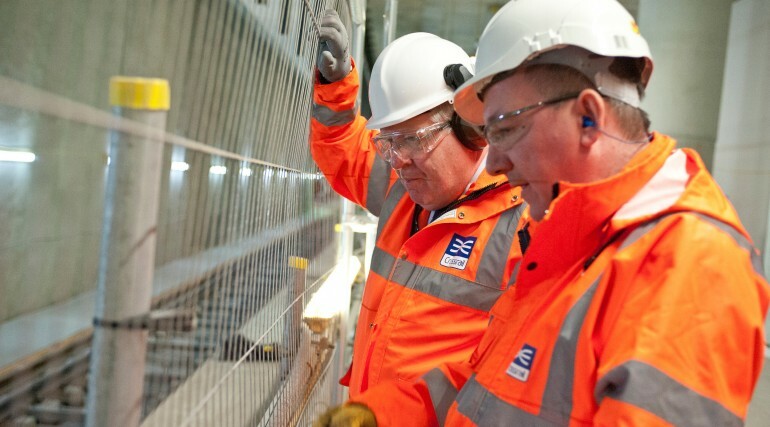 Transport Secretary Patrick McLoughlin visited Crossrail’s Canary Wharf, Woolwich and Abbey Wood stations to view progress on Europe’s biggest infrastructure project and to see first-hand the regeneration taking hold across southeast London. The Transport Secretary visited Canary Wharf station to see Crossrail’s most progressed station in the heart of London’s fastest growing business district. Mr McLoughlin viewed the recently completed ticket hall and platforms, and the preparations taking place for the installation of the systems needed to operate the station from 2018. The arrival of Crossrail at Canary Wharf and Custom House will support further growth and development in Docklands and the Royal Docks. Mr McLoughlin then travelled to Woolwich to view the significant regeneration taking place in the area, including the first of a thousand new homes which are now under construction above the Crossrail station. In the station itself, the 250m long platforms, lift shafts, and floor slabs are nearing structural completion. From early next year, the fit-out of the station will begin, including escalators, wall cladding and electrical systems, to turn the structure into a fully operating station. The final stop on the trip was Abbey Wood where Network Rail has recently started to build the new station. The foundations of the station are currently being installed and the building will soon become visible above ground for the first time. The station, which will be built over two new dedicated Crossrail tracks and those used by North Kent services, will open at the end of 2017. Transport Secretary Patrick McLoughlin said: “The progress that Crossrail is making is truly impressive, and it is great to see how the project will not only provide better journeys for passengers across London but will also support massive regeneration in the surrounding areas. Rapid transport links to the City and the West End will unlock investment and jobs, supporting further economic growth and local development. Crossrail will significantly reduce journey times and improve connectivity between southeast London and the capital’s key employment areas. From Abbey Wood and Woolwich, journey times to Canary Wharf will reduce to less than 11 minutes and shave up to 40 minutes off the journey to Heathrow. Mr McLoughlin also travelled on the Jubilee line and the Emirates Air Line to see how London’s newest railway will integrate with the existing network, linking some of London’s fastest growing residential areas to key business and leisure districts. Crossrail is nearly 70% complete and is being delivered on time and within budget. More than 10,000 people are currently working directly on Crossrail at around 40 construction sites. 485 apprenticeships have now been created on Crossrail and nearly 12,000 people have been trained at the Tunnelling and Underground Construction Academy in east London, the UK’s only tunnelling academy. Crossrail’s job brokerage service has also employed over 4,000 local people onto the project, 1 in 4 of whom were previously not in employment or training. Crossrail will add 10% capacity to central London’s rail network. It will serve 40 stations, connecting Reading and Heathrow in the west with Shenfield and Abbey Wood in the east. TfL-run Crossrail services through central London will commence in December 2018. An estimated 200 million passengers will travel on Crossrail each year. Canary Wharf is the most progressed of Crossrail’s 10 new stations. Eight 30 metre long escalators, nine 11 metre long escalators, six lifts, flooring, wall cladding and space for station services are all in place in the ticket hall level. Situated in the North Dock of West India Quay, Canary Wharf is one of the largest Crossrail stations. The station, retail and park areas are six storeys high and at 256 metres long the development is slightly longer than the height of One Canada Square. The station development will provide a new link between Canary Wharf and Poplar, currently separated by the North Dock, and includes links to the Canary Wharf Estate, via Adams Place and the Jubilee line and DLR stations. Construction of Canary Wharf station box was undertaken by Canary Wharf Contractors Limited, a wholly owned subsidiary of Canary Wharf Group plc. The Group contributed £150 million towards the costs of the new Crossrail station and delivered the station box for a fixed price of £500 million. Canary Wharf Group has also delivered Crossrail Place, a four-storey retail development above the ticket hall and platform levels, which was opened on 1 May and includes more than 100,000 square feet of retail space. The whole development is topped by a roof garden which incorporates a community performance space and restaurant which is semi-covered by a striking Foster + Partners designed timber lattice roof. The new Crossrail station, including the 250m long platforms, lift shafts, and the floor slabs, is nearing structural completion. The station box was constructed by Berkley Homes. From early next year, the fit-out of the station will begin, including escalators, wall cladding and electrical systems, to turn the structure into a fully operating station. The station box is 18m deep, 26m wide and 256m long. From 2018, up to 12 Crossrail trains an hour will make it quicker and easier for residents in Woolwich to get to a range of destinations across London and the South East. Woolwich will see some of the biggest journey time savings on the TfL-run Crossrail route, with fast and direct access to destinations such as Canary Wharf (8 minutes), Liverpool Street (14 minutes) and Bond Street (20 minutes). More than a thousand homes will be constructed above the new Crossrail station in Woolwich as part of two separate developments at Royal Arsenal Riverside; one by Berkeley Homes and another by Crossrail. From 2018, a train every five minutes during the peak will allow residents to travel right through the capital without having to change trains. The journey from Abbey Wood to Canary Wharf and Bond Street with TfL-run Crossrail will be around 20 minutes quicker and passengers travelling to Heathrow will be able to cut around 40 minutes off their journey.